This old boiler from DS 8 is seen at the Don River Railway in this scanned photo view of May 1993. The WF class of 2-6-4T locomotive was originally built for the New Zealand Railways in 1904 to a design by A. L. Beattie and intended primarily for suburban duties. 41 engines of this type were built, of which eight were sold second-hand to the Tasmanian Government Railways in two batches of four each in 1939 and 1944, where they were knows as the "DS class" and numbered DS 1 - 8. Of these, DS1 and DS4 were later acquired by the Mount Lyell Railway. The last New Zealand Railways WF was retired in March 1968, while the last Tasmanian engine, DS 7 (ex-WF 434) was retired in 1958, some ten years earlier. This was due to the dieselisation of the Tasmanian Government Railways and in particular the arrival of the V-class shunters (similar to the New Zealand Railways DS class) and the DP-class railmotors on suburban lines. 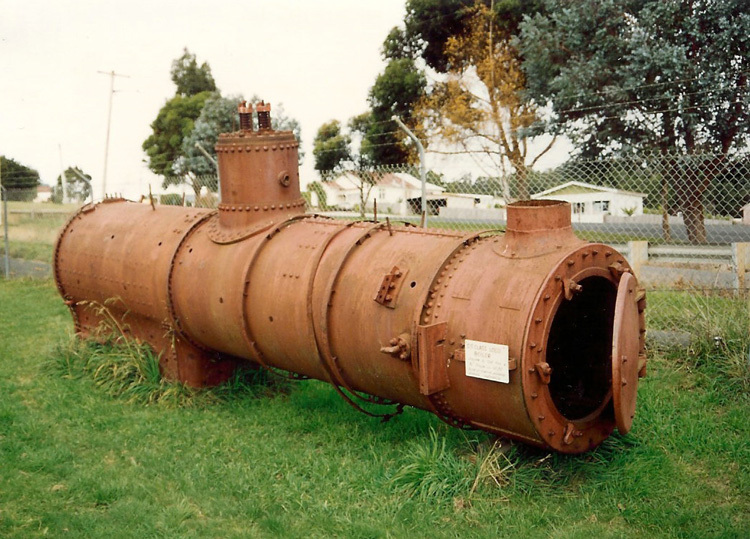 On retirement, the boilers of DS 7 and DS 8 (ex-WF 392) were put to work as stationary boilers, that from DS 8 was at Launceston Works to power the caustic baths. These two boilers were from the second batch of DS class engines which had been fitted with new superheated boilers at the Hutt Workshops in Wellington during the overhaul process in 1944. They were in reasonably good condition at the time and so were adopted for stationary purposes. WF 403 is being restored at Nelson. 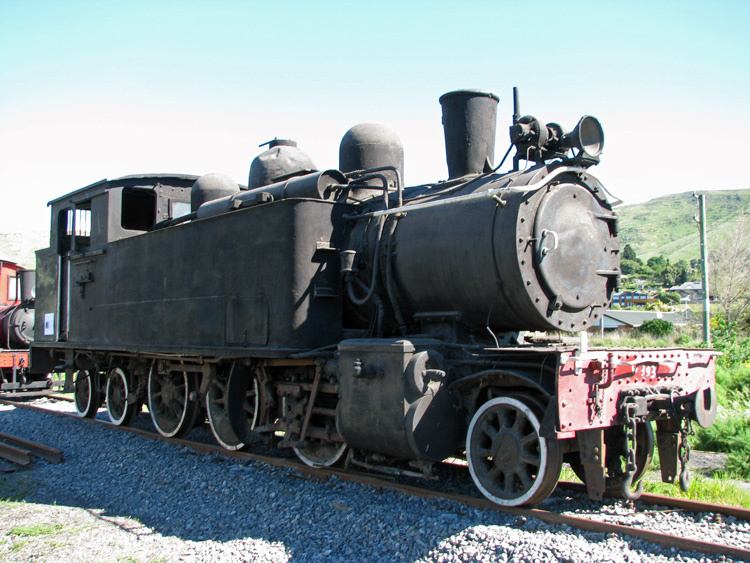 Photos of these locomotives can be found on a New Zealand website, www.nzrsr.co.nz. In addition, there is a good Wikipedia page on the WF class which includes technical details. Preserved New Zealand Railways locomotive WF 393 seen at Ferrymead on 26 October 2013 during the NZ Rail 150 event. 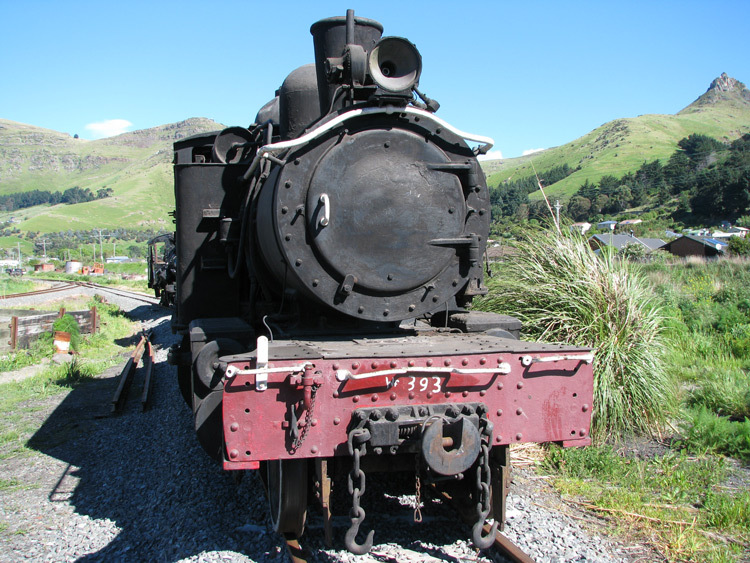 A second view of WF 393 at Ferrymead on 26 October 2013. Westinghouse air brakes and no marker lights. WF 393's cowcatchers have also been removed for storage. These two photos were kindly contributed by Alastair Cross (with copyright waived). 6 March 2013 and 15 May 2014.